Navarra export catalogue - Gabarbide, S.A.
Five centuries of wine making have proved that Señorío de Otazu is located in a privileged grape growing area. 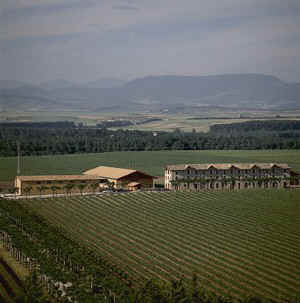 The Bodega Señorío de Otazu is located in the Pamplona valley surrounded by mountains on the left bank of the Arga river. Its vineyards are the northernmost red grape plantation in Spain. The Estate’s soil is quite varied. Sand and gravel soils predominate. Considerable stone ensures adequate permeability and filtration. The absence of salinity is a permanent feature of the soil. These soil characteristics and the temperature differences between day and night, contribute decisively to the high quality of the grapes. The special qualities of soil and climate and the careful selection of the varieties, provides the grapes with a superior quality for wine making. In Señorío de Otazu, Tempranillo, Merlot and Cabernet Sauvignon varieties have been planted to elaborate red wines; white is 100% Chardonnay. There are fifteen clones of red grapes and three clones of white grapes, so that their characteristics complement one another. The healthy, ripe grapes with top quality skins are harvested and vinified. The wines are aged in 2.000 brand new French oak casks (225 l. each), stacked on one level. Our wine is of the highest quality and is made from our own grapes. Our red wines have aged in brand new French oak casks, were they have been carefully kept for at least over one year and stored under adequate conditions for several months in the bottle. Our vintages are a special blend of the Estate’s Tempranillo, Merlot and Cabernet Sauvignon varieties. Our 100% grown Chardonnay produces a young white fermented in stainless steel tanks and a more sophisticated vintage Chardonnay allowed to ferment in French Allier casks, that constitutes a wine to be very proud of.